Refresh and personalize your workspace with fun designs! Precise™ surface enhances the precision of optical mice at fast speeds. Durable foam mouse pad with nonskid backing is safe for desktop surfaces. 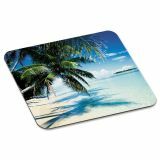 3M Mouse Pad with Precise Mousing Surface, 9" x 8" x 1/8", Beach Design - Refresh and personalize your work space with the fun tropical beach. Precise surface enhances the precision of optical mice at fast speeds. Nonskid backing keeps pad in place when mousing.